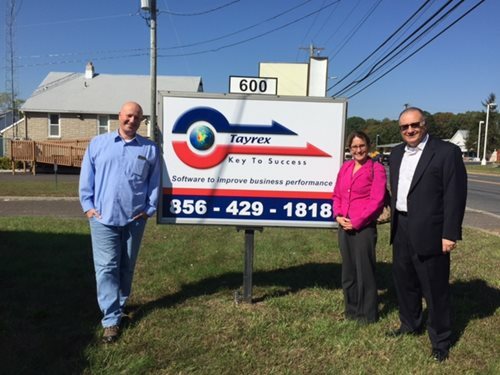 TRENTON (October 17, 2016) –Software and consulting firm TayrexCorporation was founded by the Tayar brothers over a decade ago to helpbusinesses streamline operations. Headquartered in Lindenwold, with operationsin Israel, the company creates custom applications for companies of variousindustries to improve areas such as warehouse fulfillment, dispatch systems,and customer relationship management. In August, Tayrex Corporationclosed on an $85,000 loan through the New Jersey Economic DevelopmentAuthority’s (EDA) Small Business Fund to help the company launch a new product– Medulla Pro. The software will help field service engineers and techniciansaddress a range of concerns, including pressure to bolster service-relatedrevenue, combat real-time communication issues, and improve scheduling, routingand dispatch. EDA Chief Executive OfficerMelisa Orsen visited the company today as part of the EDA’s ongoing efforts tofacilitate awareness of the programs it offers to support small and mid-sizedbusinesses and not-for-profits. The EDA’s activities to promoteits programs in support of small businesses are based on the theme “EDA WasHere.” The campaign and new social media presence highlight howorganizations like Tayrex have used the EDA’s financing programs to overcomechallenges, meet their needs and grow. In 2015, the EDA closed on over $440million in traditional financing assistance, including bonds for manufacturersand not-for-profit organizations. The Small Business Fund, under whichTayrex benefited, offers creditworthy small, minority-owned or women-ownedbusinesses assistance of up to $500,000 and features an expedited approvalprocess and fixed interest rates.